Region: Found throughout North America. Life cycle: This Beetle produces one to two generations each year. The adult flea overwinters in garden weeds and garbage. Physical Description: The small dark beetle derived its name because it jumps quickly when bothered. The beetle is shiny black with curved white or yellow stripes and is only about1/10 inch long. The white eggs are very small and are laid in the soil. 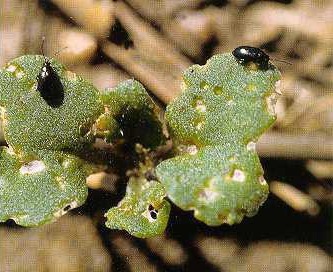 Feeding characteristics: The adult and larvae will eat small holes in the foliage of broccoli, cabbage, cauliflower, corn, eggplant, horseradish, peppers, potato, spinach, and tomatoes. There are similar species on almost every type of vegetable. This beetle carries and transmits bacterial and viral diseases, such as, Stewart's disease. This disease stunts the growth of young corn plants and can kill them. Controls: Since the eggs are laid in the soil, frequent cultivation will help. Keep your garden clean and free from debris to discourage the insect from settling. Weeds should also be kept clear to reduce the food source for both the adult and larvae. You can also plant your potatoes or other crops near the shade, since this pest doesn't care for shade. The beetles are also disturbed by alternating your garden sections with kohlrabi, radish, and lettuce between your crop. Wood ashes repel them, as does catnip, wormwood, and garlic spray. As a last resort, you can dust with Diatomaceous earth or with rotenone for serious infestations.